Look no further for the perfect finishing touch to your holiday cookie platter! 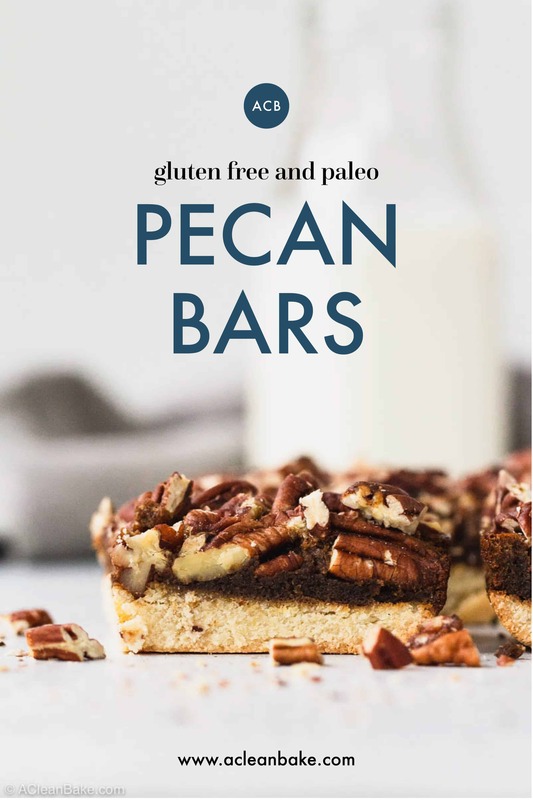 These gluten free and paleo pecan bars are full of flavor and texture, delicately sweet, and beautiful to look at. They’re lightly sweetened with dates and molasses and topped with a generous helping of crunchy pecans. Plus, they’re fun and easy to make, and a joy to eat! What a month it has been, and we’re not even halfway through! Typically, the last two months of the year are aggressively busy for my family. We have anniversaries, birthdays, and holidays nearly every week for 8 weeks straight. It’s fun!… in a grueling kind of way. So, what better time of year to plan an unusually complicated move*?! We like to keep things interesting around here, that’s for sure. But, obviously, this is a busy time of year for everyone. I don’t know a single person who isn’t hustling all month long, trying to get all the presents wrapped, all the cookies baked, and all the trees trimmed and menorahs lit. Meanwhile, there are still jobs and kids and doctor’s appointments – life goes on. I’m sure I don’t need to remind you of this, since you’re very likely in the thick of it too, right now. Instead, let’s talk about how you can totally pull off this holiday dessert recipe with the limited amount of time and bandwidth you have. Let’s start by talking about what they are not. Pecan pie (in pie form, or in bar form) is characterized by the caramelized texture and flavor of the filling. Typically, pecan pie recipes call for creating a sweet, viscous filling made from a corn syrup (or another sugary syrup) base, which is cooked before being mixed with (or poured over) the nuts to make the pecan filling. The syrup further caramelizes as it bakes, hardening slightly and suspending the pecans in place throughout the pie. 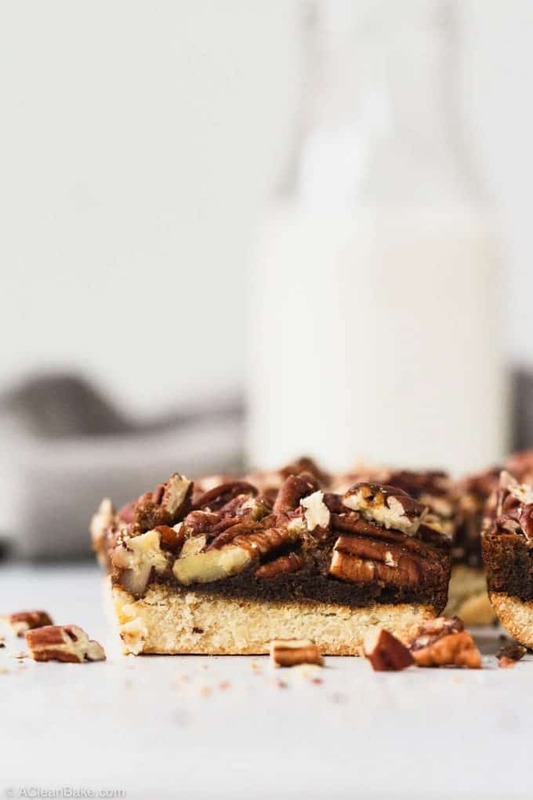 These bars are made differently – but they still have enough similarity to the original that, if you’re a fan of pecan pie, you’ll love these bars. 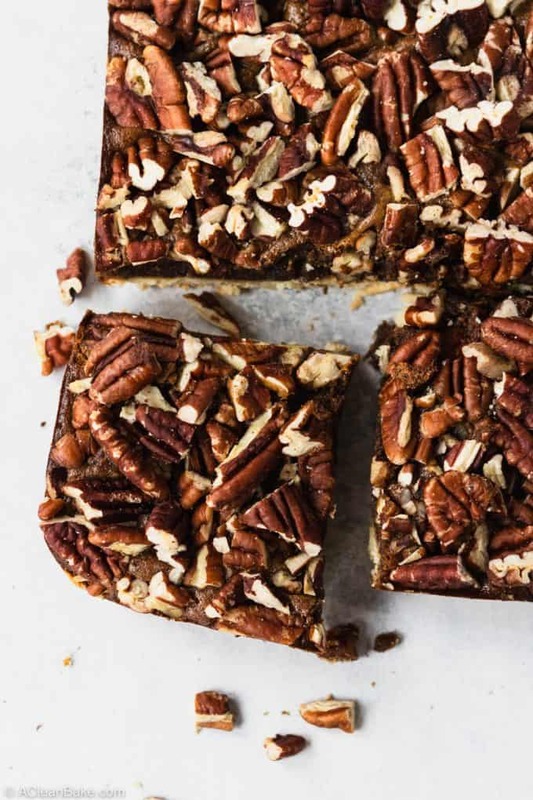 But that doesn’t mean that these bars don’t make a pretty darn good stand in for paleo pecan pie, especially if you don’t have the time/energy/desire to roll out a fussy crust for a traditional pecan pie. If you don’t have the time to be meticulous, bars are always the unfussy answer. I used my go-to paleo pie crust recipe as the base for these bars, which produces something similar to a shortbread crust for the base of the bars. 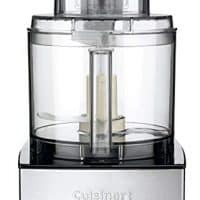 The recipe calls for simply throwing almond flour, coconut flour, coconut oil (or butter, if you don’t need this to be dairy free), molasses, and salt into the food processor, and letting the machine do the work to mix it all together. Since the baking pan will shape the crust, you can skip all the rolling and chilling. All you need to do is turn the dough into the prepared pan, cover it with a piece of wax paper or parchment paper, and use your hand or a spatula to pack it and flatten it into an even layer. You can even skip the paper, and use your hand, but that’s a mess, and a mess means extra cleanup. You have to save those seconds when you can these days. Did I mention that the food processor is indispensable for prepping this recipe? In another stroke of time-saving genius, the filling can be made while the crust is pre-baking. You’ll start by pureeing your dates, eggs, and molasses into a thick soupy consistency, and then you’ll add the remaining filling ingredients (salt, vanilla extract, spices, and a bit of coconut oil) and process a moment more until everything is combined and the consistency is very smooth. It only takes a few minutes and, once it’s ready, your crust should be ready too. Pour the filling into the pan, cover with pecans, and bake to perfection. There is a full 2 cups of pecans weighing down these bars, because the holiday season is not the time for anything short of excess. But the most labor intensive part of making the topping is simply scooping the pecans out of the bag and running a knife through the pile. So, about 30 seconds of work is all these will take. Look, there are times to painstakingly select all the best looking pecan halves and arrange them in a hypnotically precise pattern. Then, there are times, like today, when you really just need a pecan topping that consists of some roughly chopped nuts sprinkled over the filling. How do I make this diary free? If you follow the recipe as printed, and use the coconut oil option in the crust (rather than butter), it is dairy free. How do I make this vegan? I don’t know. The eggs are essential to make the crust and set the filling. Are these low carb and/or sugar free? 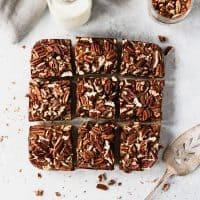 They’re lower carb than conventional pecan pie or pecan pie bars, but they are not keto compliant, if that’s what you’re looking for. (Please see the nutrition info after the recipe for more specifics.) The bars are not sugar free, but they are relatively lightly sweetened, especially compared to most holiday desserts. I do not recommend replacing the dates or molasses in this recipe with stevia, monk fruit, or another zero-glycemic sweetener. How can I tell when the crust is pre-baked enough? It will be slightly golden brown around the edges and lose some of the sheen it has when it’s raw. What variety of dates should I use? Use dried medjool dates, which you can usually find in your grocery store’s produce section. I also get them from Imperfect Produce (use code “acleanbake” for 50% off of your first box). I am out of molasses/don’t like molasses/don’t want to go to the store. What can I use instead? Molasses isn’t something I typically keep on hand either, but it is worth a trip to the store for this recipe. If you absolutely cannot use molasses, you can try maple syrup instead. How can I take it up a notch? 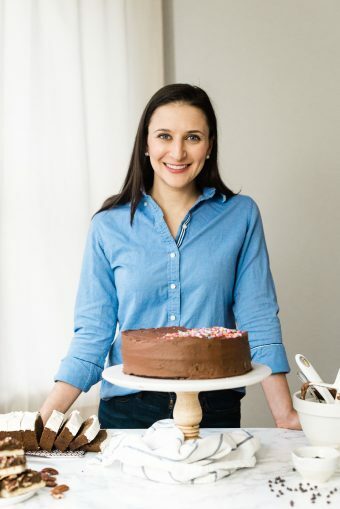 Replace up to 3/4 cup of the pecans in the topping with chocolate chips before baking, or melt some dark or white chocolate and drizzle it over the top of the pan of cooked and cooled bars and allow the drizzle to cool and mostly set before slicing. Did I leave anything out? If you have any other questions, feel free to leave me a comment below! This is very likely going to be my last post of the year, since I’ll be busy with moving and then holiday travel and seeing friends who are in town for Christmas. Merry Christmas to those who are celebrating, and Happy New Year! See you in 2019! Look no further for the perfect finishing touch to your holiday cookie platter! 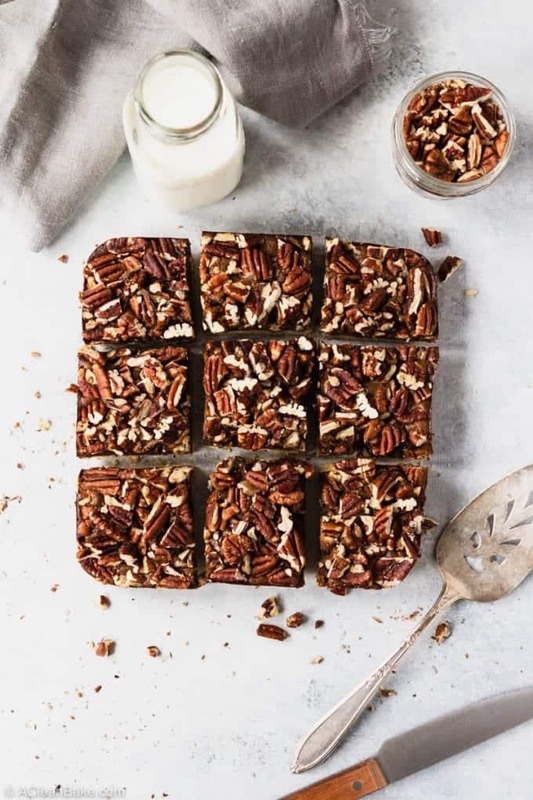 These gluten free and paleo pecan bars are full of flavor and texture, delicately sweet, and beautiful to look at. They're lightly sweetened with dates and molasses and topped with a generous helping of crunchy pecans. Plus, they're fun and easy to make, and a joy to eat! Preheat the oven to 350°F. Lightly grease an 8"x8" baking pan and set aside. Prepare the crust dough as directed, and press it into the prepared baking pan. Cover the crust with a piece of parchment paper, then top with dry beans or pie weights. Bake crust for 10 minutes until the edges begin to turn slightly golden. Remove from oven and set aside; do not turn off the oven. Remove the pie weights and parchment from the crust and set aside. Set the crust aside to cool slightly while you make the filling. With the processor running, add the melted oil or butter in a thin stream. Pour the filling into the pre-baked crust and gently smooth into an even layer. Roughly chop the pecans, then sprinkle them evenly over the top of the filling. In the oven that is still heated to 350F, bake for 35-40 minutes, until firm. Remove from oven and let it cool for at least 20 minutes before slicing and serving. Pre-bake the crust and freeze it (completely cooled) in the pan, tightly wrapped, for up to three months. Bring it back to room temperature before filling and baking. Or, make the bars as written, but do not slice them. Cool completely, wrap tightly with plastic (in or out of the pan) and refrigerate for up to three days or freeze for up to three months. Bring to room temperature before slicing and serving. 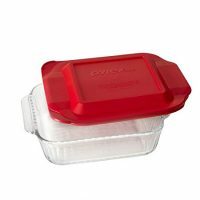 You can also use this method to store leftovers. For additional baking and customization notes, please read the entire post, which is full of useful information!